down into the world, down into the underground. . . . The True Sun-Beyond I Am — and Only Am. Therefore, open to My Light — and Be Melted by Me. Editor's Note: This article is in three sections. The first section is an excerpt from the introduction to Hridaya Rosary, one of the "Source-Texts" of the Way of Adidam. It discusses the precise meaning of the word " Spiritual" — and how, in the Way of Adidam, the prepared devotee receives Adi Da's Spiritual Transmission as a Gift. The second section, from Part Four of Hridaya Rosary, is the " Third Thorn" of the " Four Thorns Of Heart-Instruction". While it has many esoteric terms that are unique to Avatar Adi Da's Teaching in Hridaya Rosary, and that are explained more completely in the full text of the book, it can be enjoyed and received as a profound and poetic description of the Spiritual-Baptism offered by Avatar Adi Da to devotees who are " mature" in the moment-to-moment practice of the devotional Yoga given by the Him. The third section — " My Garden Is the Space from Underground to Infinity", from Part Six of Hridaya Rosary — is a Talk by Adi Da Samraj that further illuminates and clarifies the esoteric secrets openly revealed in Hridaya Rosary: the secrets, as He writes, of " the Nature of Reality and the Process of Divine Self-Realization". Hridaya Rosary is Avatar Adi Da's beautifully precise and exquisitely poetic description of the Spiritual process in His Company — the process that is spontaneously entered into when one is Spiritually Awakened by Him. The title is a blending of East and West, expressing Avatar Adi Da's embrace of the entirety of humankind. "Hridaya" is Sanskrit for "Heart". "Rosary", in its ancient meaning, comes from Latin "rosarium", meaning "rose garden". Thus, "Hridaya Rosary" is "the Rose Garden of the Heart" — the supremely Blissful Condition of being in-Filled by Avatar Adi Da's tangible Spiritual Blessing. In this remarkable Text, Avatar Adi Da Himself is the Rose that Fills this Garden with the Perfume of His Own Love-Bliss-Happiness. But He also makes clear that His Divine Beauty can truly be Known only when the ego is transcended. That is the meaning of the "Thorns" to which He refers in the subtitle. "Four Thorns" is His poetic reference to the counter-egoic practice that He Gives to His devotees — the practice that makes it possible to enter into Spiritual Communion with Him. Thus, as the Rose, Avatar Adi Da Samraj has not only brought Himself into the world, He has also brought the means by which He can be Known (or Realized). 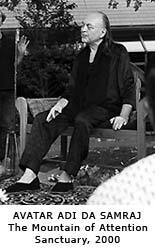 On March 11, 1997, Avatar Adi Da Samraj traveled from the Mountain Of Attention Sanctuary (in northern California) to the island of Kauai in Hawaii, where He stayed for a period of five weeks. This was the time and place in which He would write Hridaya Rosary. On March 22, there was a conjunction of powerful energies in nature. It was the day of the spring equinox, and also a full lunar eclipse. Winds blew up suddenly around midday, and a storm broke out. In the midst of this natural energy-vortex, Avatar Adi Da sat at His desk and began to write. He wrote for a full week, without passing on the manuscript or saying anything about what He was writing. Finally, on March 29, Avatar Adi Da gave the new manuscript to a devotee to be typed and returned to Him. It was 13 pages of His boldly written hand, on plain sheets of archival paper. The manuscript was divided into four sections, but did not yet have a title. Avatar Adi Da subsequently went on to greatly expand and refine this Text. Nevertheless, He memorialized the significance of this initial writing by adding the date "March 29, 1997" at the end of the Text. Hridaya Rosary is the only Text of Avatar Adi Da's that is dated by Him in this manner. Hridaya Rosary (The Four Thorns of Heart Instruction), is available from The Dawn Horse Press.